Unlike some other manufacturers suppressors, we have no cold shot/first round POI deviation, the second shot and all subsequent shots all hit in the same place. The SHADOW series will meet your requirements for sound reduction, accuracy and minimal POI shift. POI shift is always straight down from unsuppressed, suppressor orientation on the barrel does not matter. POI shift will depend on barrel length, barrel profile and suppressor weight. In general, longer, thinner barrels and heavier suppressors have more POI shift than short fat barrels, and light suppressors. Anytime you add weight to the end of barrel, you get some POI change. There is no such thing as a no POI shift suppressor. Shadow – is 8.0″ long with a 1.5″ OD. Thread mount is 5/8″-24 pitch standard, 9/16″-24 can be ordered. Constructed with 100% 300-series stainless steel, the Shadow delivers 28-34 dB suppression levels with full power ammo, and up to 36 dB with subsonic ammo depending on ammunition and barrel length. Weight is 28 ounces with the thread mount. This suppressor is very pleasing to shoot as no hearing protection is required with .308 ammunition at 135 dB absolute on an 18″ barrel rifle. Designed for optimum accuracy, this is a superb tactical suppressor designed for professional use where accuracy and flash suppression is paramount. Shadow XL – is 9.3″ long and approximately 4-5 dB quieter than the regular SHADOW. Constructed with 300-series stainless steel with a 5/8″-24 thread mount. Weight is 32 ounces. The SHADOW XL is .300 Win Mag rated and reduces the sound signature below 137 dB. It’s built for full-time use on magnum rifles and has an Inconel blast baffle. All of our Titanium Shadow series suppressors are constructed from 6Al-4V and grade 9 titanium. Titanium Shadow TI – This is the professional’s choice for .308 rifles. Exact same dimensions as the Shadow, but 16 oz, 5/8″-24 thread mount only, it features a 316 stainless steel blast baffle to prevent ablation and sparking. Titanium Shadow XL TI – 9.2″ long and approximately 4-5 dB quieter than the SHADOW TI. It has an inconel blast baffle, and a 5/8″-24 thread mount. Weight is 18 ounces. The SHADOW XL TI is .300 Win Mag rated reduces the sound signature below 136 dB. It’s built for full-time use on magnum rifles with an Inconel blast baffle. 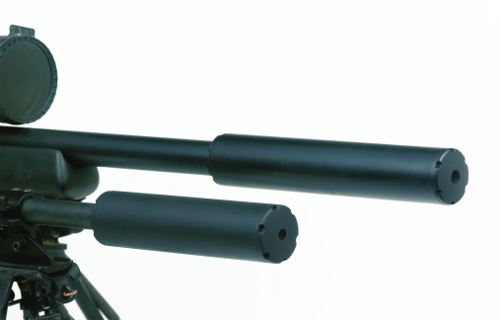 Shadow LM – is a .338 Lapua Magnum capable suppressor that is 10.5″ long and weighs 34 ounces. Constructed of 304- and 316-series stainless steel, Inconel and high strength alloy steel, the Shadow provides over 35 dB of suppression (absolute dB is 137 dB on a 26â€³ barrel rifle). Recent independent testing using the Larson Davis 800B sound meter yielded 137 dB absolute at 1 meter left of the muzzle, and 135 dB 15cm from the shooters ear. Outside diameter is 1.5″. Standard thread sizes available are 5/8″-18, 5/8″-20, 5/8″-24, 11/16″-24 and 18X1 metric. 11/16″ and 18mm thread are a slightly additional cost. Titanium SHADOW LM TI – .338 Lapua Magnum suppressor is 10.5″ long, has a 1.5″ OD, and weighs 18 ounces . The Titanium Shadow LM features a user changeable rear thread insert in 5/8″-18, 5/8″-20, 5/8″-24, 11/16″-24 or18X1 metric so one suppressor can be used on multiple rifles that have different muzzle threads. Additional thread inserts are available at extra cost. These suppressors all use the new patented SRT AZTECH baffle system, which has been claimed by Al Paulson, a suppressor technical writer, as “One of the most innovative baffle designs since the Maxim model 1909 baffle.” The baffle is extremely strong, light, and provides superior efficiency in sound suppression. Full-power .308 ammunition meters in the 132-136 dB range, which is below the 140 dB threshhold where hearing protection is required. Engel Ballistic Research Subsonic PBS or Thumper 7.62×51 ammo meters at 122 dB; and there is no adverse effect on accuracy, In fact, many rifles shoot tighter groups with this suppressor than without it. Sub-MOA groups are typical, even past 300 yards. We recently fired five shots into one hole (.35″) group at 100 yards, using match ammo, from a rifle with the SHADOW suppressor installed. ALL of our .30 caliber suppressors have excellent sound reduction with subsonic loads, including the .300 BLK. In addition, our Shadow series suppressors have a very generous baffle and endcap aperture of about .385″, one of the largest in the industry. This is important, because subsonic bullets tend to yaw upon barrel exit, and tight tolerance suppressors can experience baffle strikes with a yawing bullet. Our Patented AZTECH baffle design allows us to use a large aperture, with no loss in sound reduction, even with high velocity ammo. Our Titanium suppressors are made from grade 9 Titanium aerospace tubing and 6Al-4V Titanium bar stock, unlike some lower priced competitors which use inexpensive grade 2 commercial Ti, which isn’t much stronger than aluminum. The SHADOW XL TI is rated for .300 RUM usage also. Additionally, “first round pop,” the propensity of a suppressor to have a much louder first round sound signature, is almost non-existent with the SHADOW. No other suppressor matches the performance of the SHADOW in degree of suppression in it’s size class. The SHADOW may also be used on smaller calibers such as the 7MM Magnum, .270 Winchester, and 5.56 NATO. SHADOW is a trademark of D.H. Melton Co., Inc., and may not be used without express written permission. All specifications subject to change without notice as we improve our products.